Alan Rinehart and Clive Titmuss will perform on guitars built by Titmuss, a West Kelowna-based luthier and early music musician. Titmuss builds instruments modelled on historic originals – in this case from the 16th and late 18th Centuries. The vihuela (early guitar) music of the 1500s was regal, intricate and highly decorated. Many of the underlying melodies are taken from folk music, which ensures its timeless appeal. Like their models, Titmuss’ instruments are also highly decorated, inlaid with tiles and completed with a complex lace pattern in the soundhole. Fashioned from the wood of the pear tree, which has an especially fine grain and rich colour, the instrument is light and responsive, with double strings. The later, 18th Century replica guitars are also highly decorated, but with flower patterns around the sound hole, inlaid with ebony and ivory laboriously recycled by Titmuss from wrecked piano keyboards. The surviving instruments from that time are numerous, but it is not known what music was played on them. Many of the instruments survived the wars and revolutions of the time, but very little printed music is available. Not much is know about how the guitar came to have its current six single strings, and the concert probes the history of that change. One of the most famous guitarists of the late 1700’s, Father Basilio, left no music himself, but taught some of the most important Spanish composers who later wrote music for what we now know as the “classical” guitar. A renowned Italian, Luigi Boccherini, heard him play and wrote down a raucous Fandango. This tempestuous dance, full of wild strumming and bravura flourishes, finishes the concert. 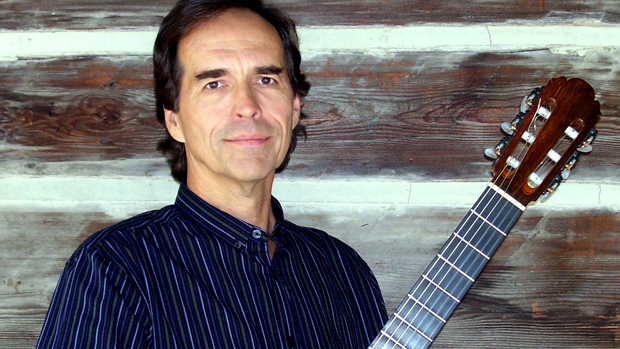 Alan Rinehart is a guitarist who has played many solo concerts throughout B.C., and with the Vancouver Guitar Quartet (which he founded). More recently, he has taken up residence in Kelowna, after great success bringing the Northwest Guitar Festival to the Kootenays. He commissioned Clive Titmuss to make copies of both the early guitar and the bigger 18th Century instrument. Fortunately, the luthier, aware of the possibilities for unique music-making, made two of each. It seemed inevitable that the two musicians, long-time friends, should team up and provide the music lovers of the Interior with the fruits of their collaboration.